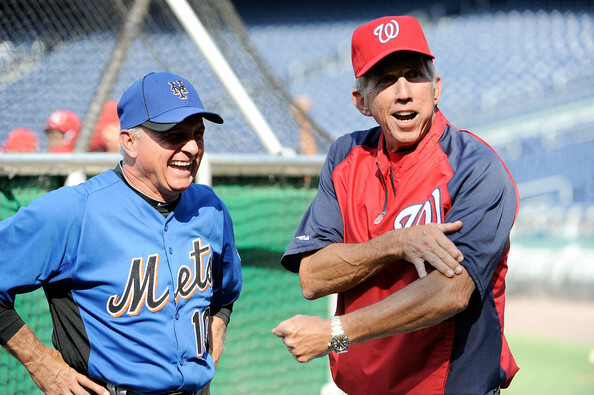 Davey Johnson began managing in 1979 with an Independent team in Florida. The next season he joined the New York Mets minor league organization, as manager of AA Jackson. In 1983 he became manager of the AAA Tidewater Tides & led the Tides to their second straight league championship. There he managed & observed many young players he would later manage in the major leagues with the Mets. Johnson had moved up quickly through the organization, and some felt he was passing other more experienced managerial candidates. But, this turned out not to be the case. Johnson had earned a math degree and was one of the first people to use computers for baseball data. He also pioneered computer-based sabre metrics while his time managing the Mets. He learned the art of batter-pitcher match ups for platooning and in-game switches from his old Orioles skipper, Earl Weaver. Johnson was not a fan of the bunt and preferred the long ball. He believed in solid pitching & "play for one run, lose by one run." In 1984 his old friend from Baltimore; Frank Cashen was now the Mets General Manager. Cashen gave Johnson the job as the Mets manager. In his first season he took the club from a 1983 last place finish (68-94) to a second place 90-72 season. An improvement of 22 games. Johnson was familiar with the young talented Mets, seeing what they could do while at Tidewater. He had faith in the youngsters and gave them a chance. His young pitcher Dwight Gooden became a phenom & brought the franchise back to life. His easy going style was also a good mix for the veterans on the team. Shea Stadium’s seats were now filled up again & there was a new excitement in New York. In 1986 the Mets were the heavy favorite & they ran away with the division from the start. The club played with an attitude & chip on their shoulder to the delight of the Mets fans. The rest of the league hated the Mets, as they brawled got into trouble, Partied hard & most of all won. Johnson brought the ’86 Mets to their best season ever, winning 108 regular season games. They beat the Houston Astros in an exciting NLCS & won the World Series beating the Boston Red Sox in a thrilling seven game set. It was the Mets first post season appearance since 1973 & their second Championship. After the Mets World Series win, the team underachieved. Johnson went on to become the first NL manager to win at least 90 games in each of his first five seasons, but made just one other post season appearance, winning the NL East in 1988. His clubs would finish second in all other five seasons he was at the helm. Johnson is by far the most successful manager in Mets history, with only Gil Hodges even coming close. He has a Mets record of 595-417 and a .588 winning percentage. He is fourth all time behind Joe, McCarthy Miller Huggins, John Mcgraw & Billy Martin (tied) in winning percentage for New York baseball managers. The Mets were expected to win more than one World Series in the late eighties. Second place finishes were not enough for the fans or Mets management. 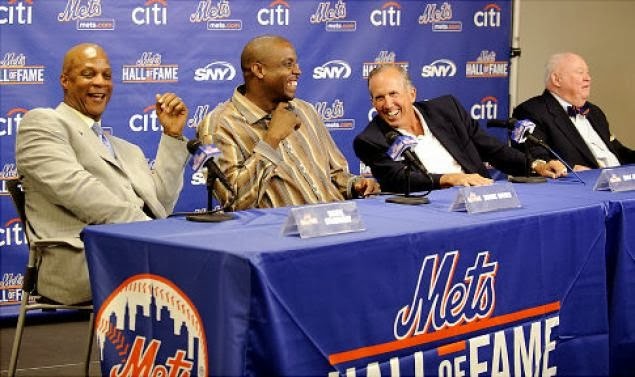 Looking back, injuries, the aging of veterans Keith Hernandez & Gary Carter, the personal dramas of Gooden, Strawberry & Dykstra, were all reasons for the Met decline. But, the manager was eventually held responsible, during a 1990 road trip to Cincinnati, Frank Cashen came to Johnson's hotel room to fired him. Johnson was let go after 42 games of the ’90 season with a 20-22 record. Mets management told the media his laid back style wasn’t cutting it anymore. After Johnson was fired, long time Mets favorite; Bud Harrelson was named manager. He took the team to a 71-49 record and another second place finish. The next season they finished fifth & were labeled the worst team money could buy. Ahead were five more terrible seasons. 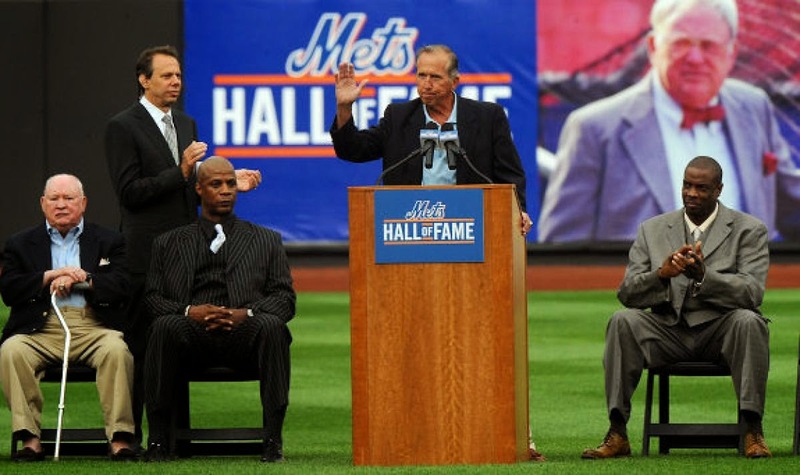 Post Mets Carrer & Mets Honors: Johnson did not attend the 20th Anniversary of the 1986 Championship team, nor the closing ceremonies at Shea Stadium in 2008. He said there was a personal falling out between him & the organization. In 2010 he finally returned to New York at Citi Field, being elected into the Mets Hall of Fame along with two of his 1986 World Champion Players Dwight Gooden & Daryl Strawberry, as well as former GM Frank Cashen. 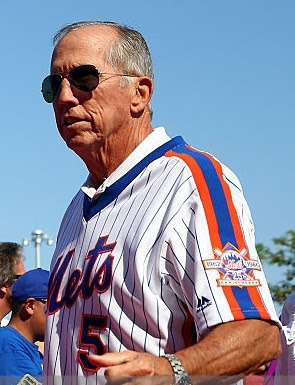 In 2006 he was on hand at Citi Field enjoying good memories with the reunion & ceremonies honoring the 30th Anniversary of the Mets Championship team. Cincinnati Reds: After two seasons out of baseball, the Cincinnati Reds hired Johnson 40 games into the 1993 season, replacing Tony Perez. He revived the Reds immediately, leading them to the NL Central lead going right up to the 1994 players' strike. 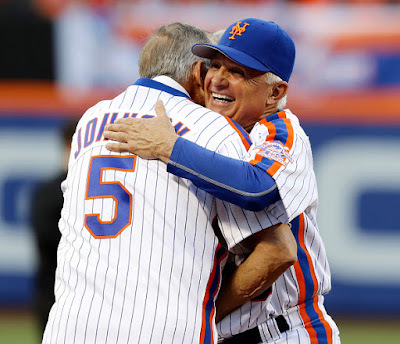 in 1995 former Met, Ray Knight was named bench coach, with the intention he would replace Johnson after the season regardless of how the team did. The Reds went on to win the first NL Central title, but Johnson was still fired at the end of the season. He had never gotten along with Reds owner; the eccentric, odd Marge Schott. According to reports at the time; the final straw supposedly was that she didn't approve of Johnson living with his –fiancée Susan, whom he later married. 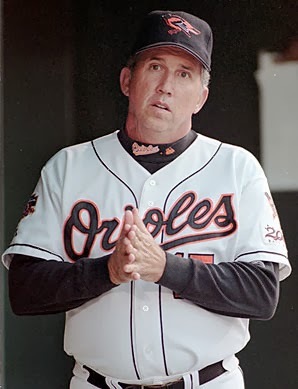 Return to Baltimore: In 1996, Johnson returned to Baltimore, now as the Orioles' manager, for owner Peter Angelos. Johnson & Angelos didn’t get along well & the two almost never spoke a word to each other. In Baltimore, Johnson once again was successful, as he led the Orioles to a wild-card playoff berth in 1996 and the AL East title in 1997. Both seasons he got his team as far as the ALCS but lost both times. In the 1997 season he won the A.L. Manager of the Year Award as his team won 98 games (98-64) but drama soon followed. After his star player; Roberto Alomar missed a charity banquet, Johnson fined him. He told Alomar to write a check to his wife’s charity but Alomar did not, even though he was advised by the Players Union to do so. Team owner; Angelos' was furious that Johnson had not asked for his opinion in the matter. The situation exploded & led to Johnson resigning as manager. L.A. Dodgers: He was soon hired by the Los Angeles Dodgers to manage for the 1999 season, replacing Glenn Hoffman. Johnson suffered his first full losing season as the Dodgers finished in third place 77-85. The team rebounded to second place the next year (86-76), but he was let go anyway, replaced by Jim Tracy. Johnson briefly managed the Netherlands national team in 2003, then served as their bench coach at the 2004 Summer Olympics. In 2005 he was manager of Team USA and in the 2006 World Baseball Classic was Team USA’s bench coach. In 2008 he served as Team USA’s Manager in the Olympics. He served as a coach in Florida & in 2009 was named the Washington nationals senior adviser. He began working within the Washington Nationals organization in 2006. Washington Nats: In 2009 he was named senior adviser to then GM Mike Rizzo. Two years later, on June 26th 2011 took over as manager after the sudden resignation of Jim Riggelman. In his first meeting against the New York Mets he lost 8-5 at Washington D.C. but took the series three games to two. In September he made a triumphant return to New York getting a huge ovation at Citi Field from the crowd. He then went out and swept the Mets in a four game series. For the season his team was 40-43 under his leadership, finishing 80-81 in third place. In 2012 he took the Nats to an NL Eastern title with a 98-64 record, again combing veterans with outstanding young players. He inserted young star Bryce Harper in the line up with no pressure put on him & had a star young pitcher in Steven Strasburg. He brought some of the biggest excitement in baseball the D.C. area ever saw. But controversy between him & Rizzo began, when Rizzo shut down Strasburg after a certain number of innings as promised. Johnson disagreed publicly & said Rizzo had no idea how to manage a team. Without the star pitcher, the Nats lost to the St. Louis Cards three games to two in the NLDS, as Edwin Jackson, Strasburg’s replacement was bombed in the series. Johnson went on to win the NL Manager of the Year Award once again. In 2013 the Nats struggled until the latter part of the season, they made a playoff run but fell short in the final days of the season, finishing with a 86-76 record. At the end of the season he announced his retirement. In his 17 year managerial career spanning 2445 games, Johnson is 1371-1071 (.562 %) winning his one world championship with the Mets. Family: Johnson's daughter, Andrea, was a nationally-ranked surfer in the 1980's. She suffered from schizophrenia & medications led to complications of her passing away. Johnson was devastated. The year before, he suffered from a serious stomach issue, which almost took his own life. Eventually his appendix was drained & removed & he recovered. He is currently married to his second wife Susan.